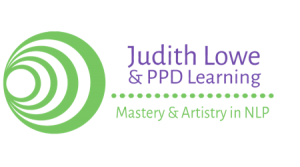 PPD Learning is one of the pioneering Neuro Linguistic Programming (NLP) training companies in the UK, and has made a major contribution to the global development and dissemination of innovative, high-standards NLP. Since the mid 1980s they have been known throughout the NLP world for intellectually curious, experiential, developmental, skills-based programmes, including our full-curriculum, integrated Practitioner and Master Practitioner courses. Judith Lowe, who is the lead trainer, is the biggest single influence on my work, a remarkable trainer from whom I learnt my core skills and who remains a wonderful mentor and friend. She has been an inspiration for much of the style of my work. We are currently in discussions around how I can begin to contribute to the portfolio of training and development opportunities that PPD provide. Watch this space!